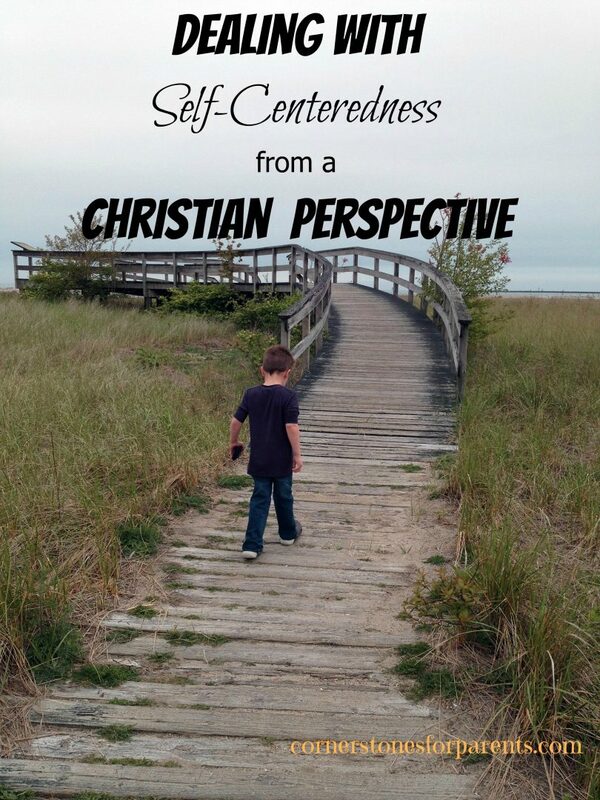 It is not uncommon for children between the ages of 2 and 7 to demonstrate self-centered behaviors. Developmentally, they tend to see life from their own perspective and view others as part of the solar system of which they are the center. But even though this is a normal part of development, Christian parents can effectively intervene during this stage to cultivate a Christ-honoring, other-orientation. Parents can accomplish this through correction and training. When you see self-centered behaviors in your child, address them in a matter-of-fact way, understanding that while this might be “normal” you can still successfully address it. If your child pushes others out of the way to be first in line, you can institute the “last will be first and first will be last” principle by simply telling him that his focus on self has earned him last place. If your child grabs something out of another child’s hand, you can gently remove the toy and give it back to the other child and say, “We don’t take things from other children.” If it happens again, employ a time out or a removal of a privilege. If your child is being loud and distracting in church, remove him from the sanctuary and find a place where you can quietly observe the service together. Ask questions like “What are people doing?” “Is everyone being quiet or loud?” “When you make a lot of noise, are you helping people concentrate or making it hard?” Try some “church practice” at home using role play. Corrective discipline will never be enough. We need to go beyond the do’s and don’ts of discipline in order to address the heart. We can do this through positive training activities. Here is one activity you can use with your two to seven year old that will help to instill an “other-orientation” when interacting with family memebers. Hang the family picture on the refrigerator or on a wall where the child can reach. Hang the sheet of stickers next to it. Tell your child that this is her “love others” poster. Every time she does something that puts a family member first (waiting her turn, addressing a need, lending a hand, etc), she can place a sticker on that particular family member. You can tell her that with this poster, she will be able to “see” how well she is doing with putting others first based on how decorated her family members are. You will need to keep your eyes open. Any time you notice your child demonstrating an other-orientation, point it out. Let her know that her heart was revealed in her behavior. Together you can go to the poster and place a sticker on the person who was the recipient of the act of kindness. The key here is that there should be nothing “in it” for the child. Don’t offer a reward for acts of selflessness or service. Encourage, don’t praise. Allow your child to experience the inward joy that comes from putting others first. You can say things like, “I can see Jesus in you when you act like that” or “That was very thoughtful the way you let him go first.” Regular encouragement and gentle reminders (“How are you doing on your love others poster today?”) will help her stay on track.